Resident Roosevelt will shortly seek authority from Congress to begin construction of the Great Lakes-St. Lawrence seaway and power project as a joint Canadian-American defense measure. A treaty for development of the project was rejected by the United States Senate in 1934. Negotiations were subsequently resumed, but a draft treaty submitted by this country in 1938 met strong opposition in Ontario and Quebec and negotiations were suspended until several months after the outbreak of the war. Early in 1940, industrial expansion resulting from the national defense programs undertaken in both countries brought the St. Lawrence project again to the fore, and, at Canada's suggestion, new discussions were initiated. Negotiations were recently completed, and a new agreement will shortly be signed by representatives of the two governments. 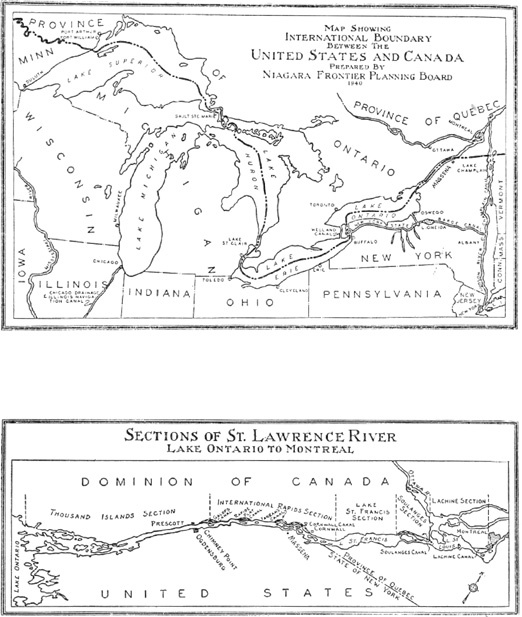 Agreement on the St. Lawrence project was made possible by the conclusion last October of an arrangement under which the United States consented to additional diversion of water at Niagara Falls by the Province of Ontario for generation of power by the publicly-owned Ontario Hydro-Electric Commission. In 1938, this country refused to discuss such an arrangement except as a part of a general agreement dealing with the entire St. Lawrence development. In a statement at Ottawa, October 14, 1940, Prime Minister Mackenzie King said that “to assist in providing an adequate supply of power to meet Canadian defense needs,” the United States had agreed to the present arrangement “pending the conclusion of a final Great Lakes-St. Lawrence basin agreement.” Consent of the United States was made contingent, however, on diversion of water into Lake Superior from the Hudson Bay watershed in an amount equal to that diverted at Niagara, thus to preserve water levels in the Great Lakes.